Chantilly and Senlis Tour from Paris Includes: Private tour guide, roundtrip private door-to-door transportation, taxes, tolls and parking. 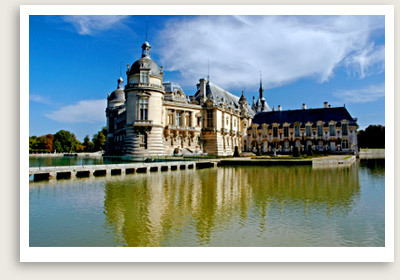 This guided tour of Chantilly and Senlis, a day trip from Paris, takes you to two beautiful towns just north of Paris. Your day trip from Paris begins with a short drive to Senlis, an enchanting medieval city known for its Gothic architecture, particularly the Notre Dame Cathedral with its towering 250-foot spire. In addition to the many interesting historic architectural gems in Senlis, there are several interesting museums you may want to explore, four of which are grouped together. The Musée de la Venerie offers a look at the area’s traditions, folklore, weaponry and more – including a curious collection of hunting-themed paintings — from the 15th century to present. Other museums are dedicated to the town’s Gallo-Roman past; its equestrian traditions; and local history. Your tour guide can give you some free time to explore the town’s maze of cobblestone streets; horse-drawn carriages called calèches can be rented if you want to kick back and enjoy the ride as Senlis’ residents of yore did. You will travel on from Senlis to the lovely town of Chantilly, surrounded by stone Roman ramparts and peaceful woodlands. Like Senlis, Chantilly is known as an equestrian town, and you can visit an 1834 racetrack here (thoroughbreds still train here daily) and the nearby “Living Museum of the Horse,” where, indeed, you can watch shows featuring live horses among other equestrian-themed curiosities. Chantilly’s most famous sight is arguably the 19,500-acre Domaine, which features a moat-circled castle, historic gardens, the Condé art museum, and seemingly endless acreage of forest.